The Harriers bought in their third loan signing in a week today, and the fifth so far this season, when they signed up Craig Nelthorpe from Doncaster Rovers on a one month loan. The left sided wide-man will probably make his debut some time for us tomorrow evening when we entertain League leaders Oxford Utd. At nineteen years old he has made just two appearances for his club so far and spent the winter of last season on loan at Conference North side Hucknall Town playing seven games for them but not finding the net. "The Chairman has been good enough to allow me to bring in one or two players if I think they're right for us. I saw Craig play a couple of times last season and he's an exciting talent who likes to go past players, he'll be very useful for us for the month he's here. I'm grateful to Sean O' Driscoll and Richard O' Kelly for letting us take him on, hopefully this will be a strong test for Craig to play senior football, and hopefully he'll be able to provide us with some good ammunition." 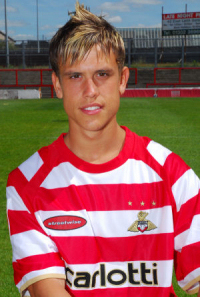 Craig has a younger brother, Liam, who also plays for Doncaster.